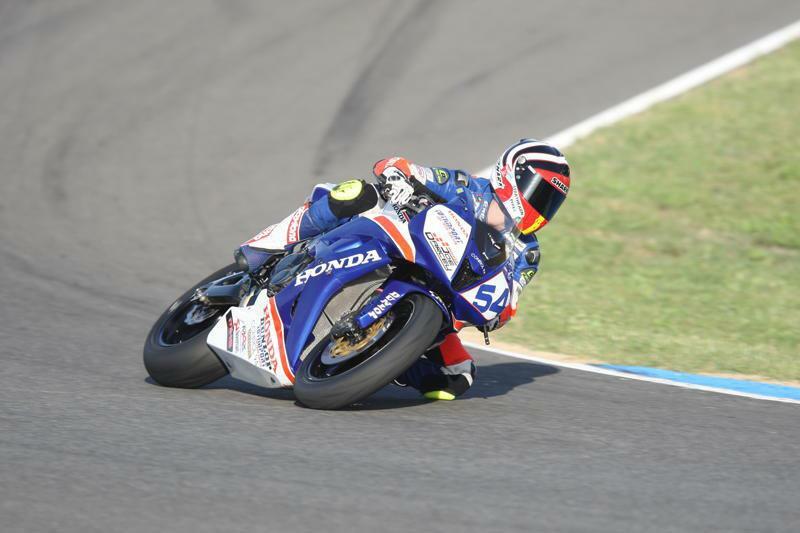 Scot Kev Coghlan sealed Spanish CEV Championship Supersport title at Jerez on Sunday with a superb ride to fourth place on his Joe Darcy Honda 600. His rival challenger Ivan Moreno suffered an engine failure on his R6 Yamaha which Alloqwed Coghlan the opportunity to wrap up the title in this penultimate round. 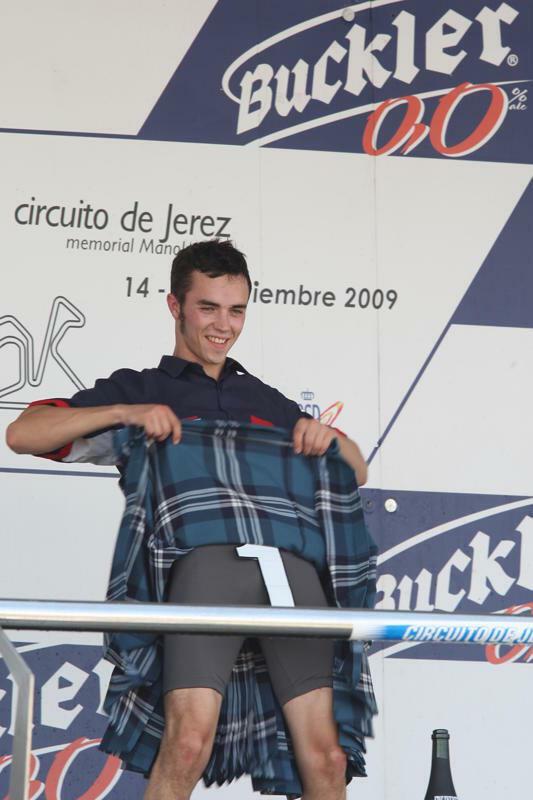 It’s Coghlan’s second year competing in Spain and an overjoyed Kevin senior was there to see his son lift both the title & his kilt during the podium celebrations! Xavi Simeon was the winner of the race with a Holiday Gym Yamaha, which coincidentally is the team Coghlan has been riding for in the World Supersport Chamionship. Coghlan’s Joe Darcy team-mate, fellow Brit Paul Veasey finished 10th whilst David Kyle brought his Kawasaki home in . William Dunlop was mixing things up mid-pack running 11th only to have his hopes dashed when his BenJan Honda ran out of fuel with four laps to go. In the 125 class, the British-based KRP Team of Taylor Mackenzie & Dakota Mamola under the watchful eye of Mark Keene & Bradley Smith made excellent progress. Taylor & Dakota gave creditable performances to finish 12th & 14th respectively. Team manager Mark Keene said: It was a mega day for the two young lads who rode well all weekend. "Both guys passed loads of riders during the race & having Bradley around to give input & feedback was invaluable. I'm sure the experience will be of benefit to them both. "We are heading straight to Almeria from here for some more testing then it's the last round at Valencia next weekend."